Ball Aerocan’s Devizes manufacturing facility presented a £3000 donation to Wiltshire Air Ambulance on Wednesday June 3. The funds are to support the organisation’s Helicopter Emergency Medical Service (HEMS) throughout Wiltshire and beyond. Ball Aerocan’s Devizes facility produces aluminium aerosol cans and has more than 120 employees. Earlier this year, Ball announced plans to add a new high-speed line at the plant, which will allow the company to meet growing customer and European market demand. The new line will begin production during the fourth quarter of 2015. As a result, Ball expects to add 25 to 30 jobs, including apprenticeships in printing, and mechanical and electrical engineering in 2015 and 2016. This summer, the plant will host an open day for the public to learn more about Ball, its employees, operations and commitment to the community. For more information about Ball Aerocan, visit www.ball.com, or connect with them on Facebook or Twitter. 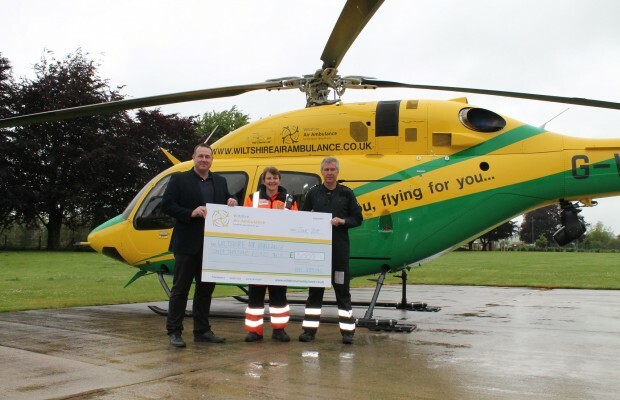 Pictured above: Warren Berry, plant manager at Ball Aerocan presenting the cheque to Wiltshire Air Ambulance.